Tender cuts of meat, such as the ribeye, are best prepared using dry heat cooking methods like pan roasting. Pan roasting is a combination of searing the outside of the steaks and roasting them in the oven. The end result is a succulent ribeye steak, which is quite easy to make with a little practice. Ribeye steak is best pan roasted in a cast-iron skillet, but any oven proof frying pan can be used. Salt and pepper are the only seasonings required, but a dry meat rub can be massaged into the steaks prior to cooking, if desired. Aluminum foil is also needed to cover the steaks while they rest. A meat thermometer can be used to test when the steaks are done. Season the top and bottom of each ribeye steak with salt and pepper to taste, and place them in the refrigerator. It is recommended that you season the steaks about four hours before cooking to allow the salt to penetrate deep into the meat. However, the steaks can be seasoned just before cooking, if necessary. Remove the steaks from the refrigerator about one hour before cooking time to allow them to warm to room temperature. Preheat the oven to 500 degrees Fahrenheit, and place your skillet inside. Leave the skillet inside for 5 to 10 minutes, and then use an oven mitt to remove it. Do not turn the oven off, as it will be used later and should remain heated. 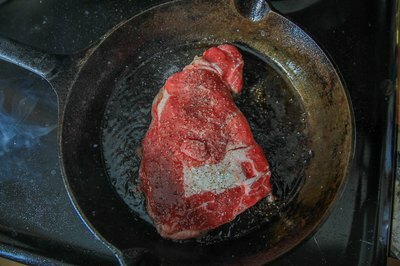 Place the skillet onto the stove over high heat, and place your ribeye steaks onto the pan. The steaks should not be touching in the skillet. Cook no more than three 5 oz. steaks at a time in a single 10 to 12 inch skillet, or the temperature of the skillet will drop, and the steaks will not caramelize. Cook the steaks for two to three minutes, and then flip with metal tongs. Cook for an additional two to three minutes, and transfer the skillet with the steaks into the heated oven. Roast for four to five minutes, or until a meat thermometer indicates that the steaks are done. An internal temperature of 145 degrees F indicates medium rare, 160 degrees F is medium, and 170 degrees F is well done. 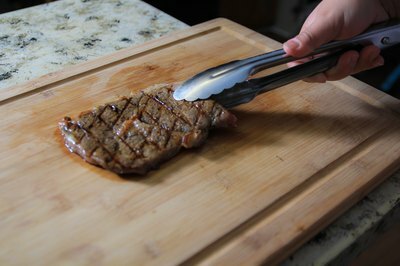 Remove the skillet from the oven, and transfer the steaks to a cutting board. Cover the steaks with aluminum foil, and allow them to rest for 5 to 10 minutes. During this time, the juices in the steak will redistribute themselves, and the internal temperature will rise by an additional 5 degrees. Remove the aluminum foil, and serve the ribeye steaks whole or sliced into thin strips. Baked potatoes, risotto, rice pilaf and steamed vegetables are some common sides that compliment the flavor of pan roasted ribeye steak. Ranch and blue cheese dressing are popular choices for salads served with the steaks.